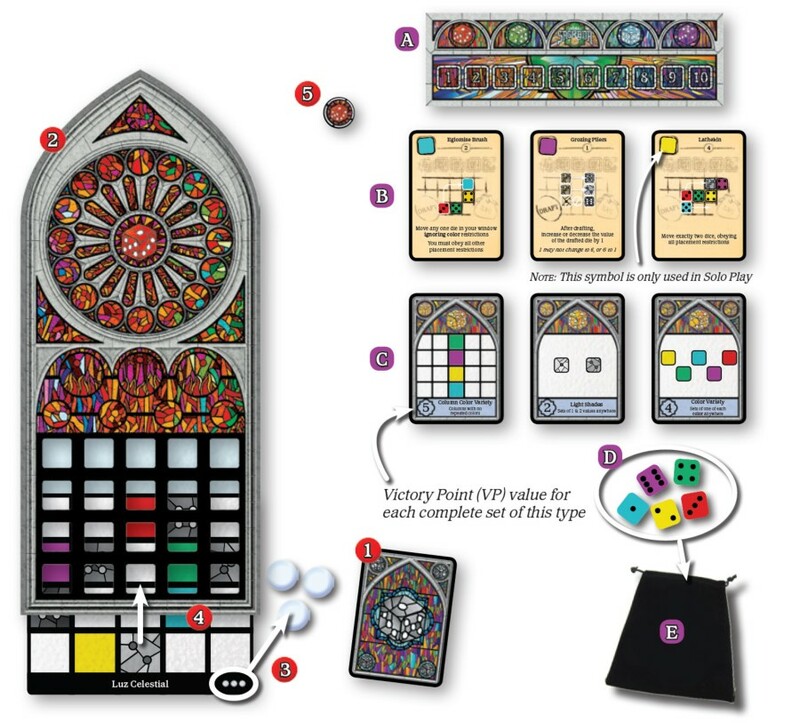 Players must place them within the color and shade restrictions on their Window card, and never have adjacent dice of the same color or value. After 10 rounds, players score points based on public and private objectives - the highest scoring artisan is the winner! 1 Shuffle the Private Objective Cards (Gray die on the back) and give 1 to each player face down. Players may secretly look at this card. 3 Give each player the number of Favor Tokens indicated by the difficulty number on their card. 4 Slide the selected Window Pattern Card into the bottom of the Player Board. 5 Place a Score Marker that matches the color of each player's board next to the Round Track, these are used during End Game Scoring. A Place the Round Track near the center of the play area. B Shuffle all of the Tool Cards and place 3 face up in the center of the play area. C Shuffle all of the Public Objective cards (Blue die on the back) and place 3 face up. D Place all 90 dice in the Dice Bag. E Randomly select a player to be the Start Player and give them the Dice Bag. One suggested method is whoever most recently visited a cathedral. Set aside all remaining Objective, Tool and Window Cards, they are not used during the game. Note: Setup is the same for 2, 3 or 4 players. 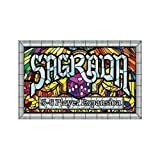 Each game of Sagrada is played over 10 rounds. Once rolled, these dice form the Draft Pool. Each action is optional - A player may choose to perform both actions, only one action or pass their turn taking no actions. Turns proceed clockwise with each player taking a turn or passing. 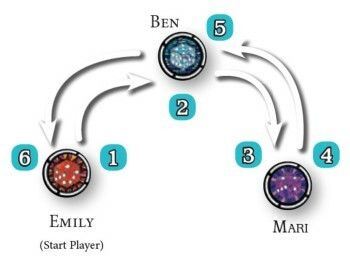 Example: Emily takes a turn 1, then Ben 2, then Mari 3. Once the last player has completed their first turn, the round continues in reverse order (counterclockwise). Beginning with the last player, each player takes a second turn (selecting a second die from the Draft Pool, etc). Example: Mari takes her second turn 4, then Ben 5, then Emily 6 Once the Start Player has taken their second turn, proceed to the End of the Round. First die: Each player's first die of the game must be placed on an edge or corner space. Every other die must be adjacent to a previously placed die, touching diagonally (different row and column) or orthogonally (same row or column). The die must match the color or value restriction of the space. White spaces have no restrictions Example - A red space on the window may only be filled by a red die (any value). A space showing a 3 may only be filled by a die showing a 3 (any color). 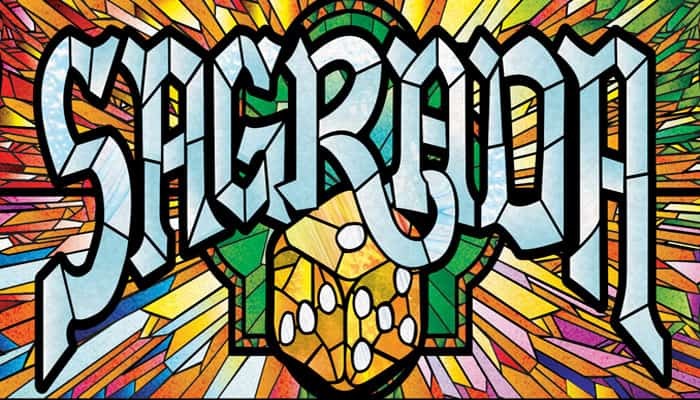 Dice may never be placed orthogonally adjacent to a die of the same color or the same value. Example - Two red dice or two dice showing a 3 may not be placed side by side. Players may choose not to draft a die during their turn. Place Favor Tokens on the Tool Card - 1 if there aren't any tokens on the card, otherwise place 2. Use the ability listed on the Tool Card. Players may choose not to use a Tool Card on their turn. Tip: Being the first to use each Tool Card costs the fewest Favor Tokens. However, Tool Card abilities become more useful later in the game as player's Windows fill with dice. All remaining dice are placed on the Round Track, covering the number space for the just completed round. If multiple dice remain (due to players skipping a draft action) these do not cover additional number spaces. The Dice Bag is passed clockwise to the next player. This player is now the Start Player - players then begin another round. Example - Ben is now the start player for the second round. If this was the end of the 10th round, it is the end of the game - proceed to End Game Scoring. The game ends at the end of the 10th round. Clear the dice off the Round Track and flip it over to the Score Track side. Use each player's Score Marker to track their position on the Score Track, flipping the marker if they exceed 50 points. Each Public Objective Card - Players may gain points from each card multiple times. Row/Column-based objectives only score for completed Rows/Columns (no open spaces). Their Private Objective Card - Summing the values of their dice of the specified color. Favor Tokens - 1 Victory Point for each unspent token. Players Lose 1 Victory Point for each open space on their window. The player with the highest Victory Point total is the winner. Ties are broken by most points from Private Objectives, most remaining Favor Tokens, then finally by reverse player order in the final round. If a Player's Window is ever found to break any of the placement restrictions, that player must immediately remove dice (of their choice) from their Window until all restrictions are obeyed. These dice are out of play and any resulting open spaces will count against their score as normal.